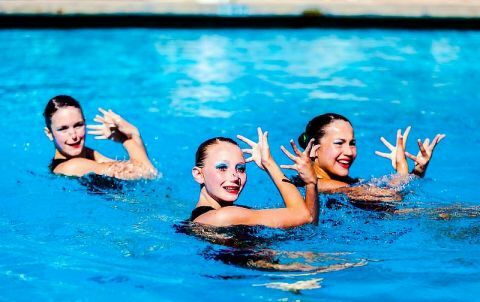 Sacramento Synchronized Swim Team (SSST) and Placer Valley Tourism (PVT) are teaming up to bring the Region B Synchronized Swimming Championship to Rusch Park Pool in Citrus Heights on May 13-15. This is a USA Synchro sanctioned event that has been around for 25 plus years and rotates between Walnut Creek, Santa Clara and Placer Valley. Nearly 300 female youth athletes are expected to compete ranging in age from 9 to 18 years old. The categories they will be competing in include solo, duets, trios and teams. Only the solos, duets and teams will be vying for a spot in the National Junior Olympics that are held in Long Island, New York on June 24 -July 2. "The top three in each event qualify to represent our region in New York; it truly is the best of the best," explained Robin Mizell, SSST Coach. "Often times, the top three at this competition are the same ones who take top honors at the Junior Olympics," added Mizell. The geographic region these talented swimmers come from is primarily Northern California including the Bay Area and Central Coast. The favored team for the younger age groups, specifically 11/12 and 13/15, is the Santa Clara Aquamaids. In the older age division, 16 and up, the local team SSST is expected to lead the competition. Mark your calendars and come on down to the Rusch Park Pool, located at 7801 Auburn Blvd in Citrus Heights to see some spectacular synchronized swimming!